Having trouble making a tough decision? Looking to settle a score by a roll of the dice? RandomMagic, an extension for Google's Chrome browser, is up to these tasks, and a few more. RandomMagic's graphics are low-quality, but it's easy to understand how to use it. RandomMagic is available in the Chrome Web Store. You simply add the extension to your browser, and you're ready to go. It appears in the upper right hand corner of your Chrome's menu bar as a small icon in the shape of a magician's hat and wand. Click on it brings up RandomMagic's options: roll a die, flip a coin, generate a number between 1 and 100, or generate a random string of letters. The rest of RandomMagic's features really are about having fun. 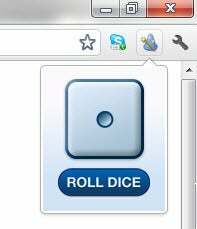 You can make a decision by flipping a coin, or you can sit at your desk and roll a virtual die. Or you can use RandomMagic to see if your computer can read your mind when you're thinking of a number between 1 and 100. RandomMagic is easy to use, but its graphics are a little rough around the edges: it may make you nostalgic for a time before HD graphics and super-slick logos became the norm. If you'd like to see it improve, you can make a donation to the developer: an option to do so is clearly displayed among the extension's options. RandomMagic may not make you more productive or speed up your Web surfing. And it certainly won't bring about world peace. But if you're looking for a fun way to waste time or trying to play a game of chance, RandomMagic could be just the thing for you. Note: This link takes you to this extension's page at Google, where you can automatically install the file into your Chrome browser. This program is donationware. It is free to use, but the author accepts and encourages donations towards further development. Can't make a decision? Let RandomMagic help you decide.